IMPORTANT UPDATE: New zip file of scanned processed images was posted at: http://www.answering-christianity.com/100_percent_guarantee_that_quran_is_divine.htm. All Praise and Glory and Thanks are due to Allah Almighty alone. I just wanted to let you all know that I just finished what I call "Phase II" in the project of translating "The Great Miracle" book, which is Mr. Adnan Al Refaei's 653-page book  that demonstrated the Number 19 Miracle in the Glorious Quran, using hundreds of amazing examples. I've been extremely busy with pushing myself and finishing phase II. All of the Noble Verses are separated and the images are set for Phase III. Phase III will be where I will be officially producing scanned images of page printouts of the Noble Verses that are in the book and demonstrate with my own hand writing the accurate counts of every single letter in every Noble Word in every Noble Verse. Phase II was to separate the Noble Verses and space them out, to allow for me to do a manual count and summation for every single Noble Letter, and Noble Word and Noble Verse. There were literally thousands of Noble Verses in hundreds of images to work on. So it was tedious and very time consuming. But all Praise and Glory and Thanks are due to Allah Almighty alone, I was able to do it. Very soon Insha'Allah (if Allah Almighty is Willing), you'll start seeing regular website updates of new "Cases" (this is what I will call them), where the Number 19 Miracle will be demonstrated for specific cases and topics, and to show how the Noble Verses that make up the "Case" will all add up accurately and perfectly. Just wanted to make sure that you read the post above. It quickly got burried with a lot of new posts that came after it. May Allah bless you for your work brother!! Your work is extremely powerful and your website is very popular on search engines! You've done great work, may Allah give you the strength to continue this fantastic work! Thank you very much dear brother Mclinkin94. May Allah Almighty greatly bless you and your family, and always keep you all in His Right Path of Islam. Ameen. There will be thousands of these PNG files of processed images, Insha'Allah (if Allah Almighty is Willing). And like I said, I am already done with processing 1/3 to 1/2 of all of them, with Allah Almighty's Mercy, Grace and Will. Now of course, I will put them in HTML files and elaborate on them for the user. I won't let the images just self-explain themselves. I will elaborate in text in the HTML files that I will produce, which will explain every Case and Miracle that a group of Noble Verses make up. There will be 100s of cases made up of thousands of Noble Verses, Insha'Allah. Thank you dear brother, ThatMuslimGuy. May Allah Almighty bless you, akhi. Thanks akhi for your work. Just wanted to ask are these the miracles where the Numerological (abjad) calculations are used to find the value of the letter? This one here is a new one that is derived entirely from the Glorious Quran. Brother Adnan Al Refaei took the Arabic alphabets, and sorted them by their occurences in the Holy Quran in a descending order (from the highest to the lowest), and he gave them their numerical values based on this. So the Numerical Table that he put together came entirely from the Glorious Quran. So the alif letter, for example, was assigned the numerical value 1, because it has the highest occurences in the Holy Quran. 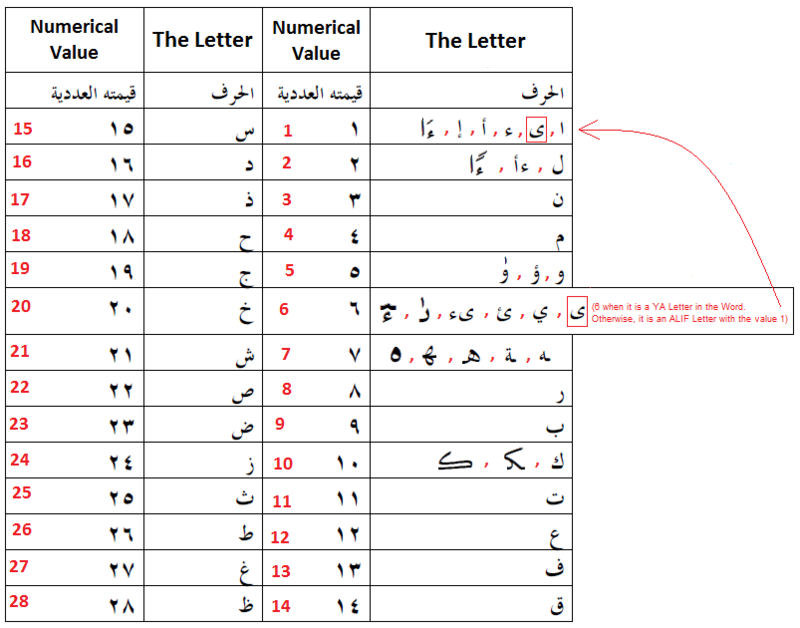 The abjad (gammatrical) table that you refer to is a non-Arabic one, and it is not based on the Holy Quran. He didn't use it, and he said that he has no regard for it, because it is not from the Holy Quran. And to his suprise, he discovered that the Noble Verses and Statements in the Holy Quran that are balanced with each others in meanings and correlations, they all also have a total numerical value that is a multiple of the number 19 without any remainder. He found this consistency by the thousands of Noble Verses throughout the Holy Quran, and he put them in his book. The links above that I gave demonstrate the Noble Verses that speak about the #19 Miracle, and they of course also have the total numerical value that is a multiple of the number 19 without any remainer, because they are what he calls a COMPLETE CASE (a set of Noble Verses that when put together, and are all a complete case in meanings and correlation, then their numerical value also MUST AND WILL be a multiple of number 19 without any remainder). Not only that, but the example that I gave above also shows that the value of the Noble Verses also matches the multiplication of the BASMALA's (the key to the Holy Quran) number of letters and their total numerical values: 19 X 115 = 2185. Another awesome example that he gave was Prophet Noah's CASE (complete Noble Verses). Not only they're made up of 950 Noble letters, and Allah Almighty Said that Noah lived 950 years among his people, but the total numerical value of the Noble Verses is also a multiple of the number 19 without any remainder. Man, this is truly a discovered Law and Miracle in the Holy Quran! It is no joke. 1- Seeing the numerical values that I give to each letter. 2- Comparing how the letter looks in both the example and the main table, and to see its numerical value in the main table. The Main Table image is: www.answering-christianity.com/main_table.png. The examples that I gave are in the post above. I have added some very important images and elaborations to the image: www.answering-christianity.com/main_table.png. This will Insha'Allah (if Allah Almighty is Willing) make it abundantly clear about how when the Alif Vowel is considered an actual letter with a numerical value, and not just a vowel without any numerical value. This is all of course in Arabic. My numbers are all in English. Insha'Allah (if Allah Almighty is Willing), once I upload all of the scanned images of all of the processed Noble Verses from the book, then I'll write an equivalent to a translation for the entire book all in English, and I will explain all of the cases in great details all in English, Insha'Allah. Really amazing stuff, i have analysed those 150 photos. some are really great there, but i dont understand many of them, i need explanation. and we see 71 words describing that situation, beautiful, just beautiful programming of the text. what is special with counting to the middle? i hope you can answer me this two questions concerning chapter Nuh, and 950 letters in it. i think that it would be totally amazing if there is 950 letters in chapter Nuh, while chapter itself says that Nuh lived 950 years, that is really mindblowing stuff, nummerical programming of the text on high level. To answer you question in the image that you posted "Why was this letter not counted? ", it's because the HAMZA is a vowel in this Noble Word. It is not a letter that is sitting on a KURSI (base) or is attached to an ALIF as in the red-circled one that I colored in the very image that you posted next to it. 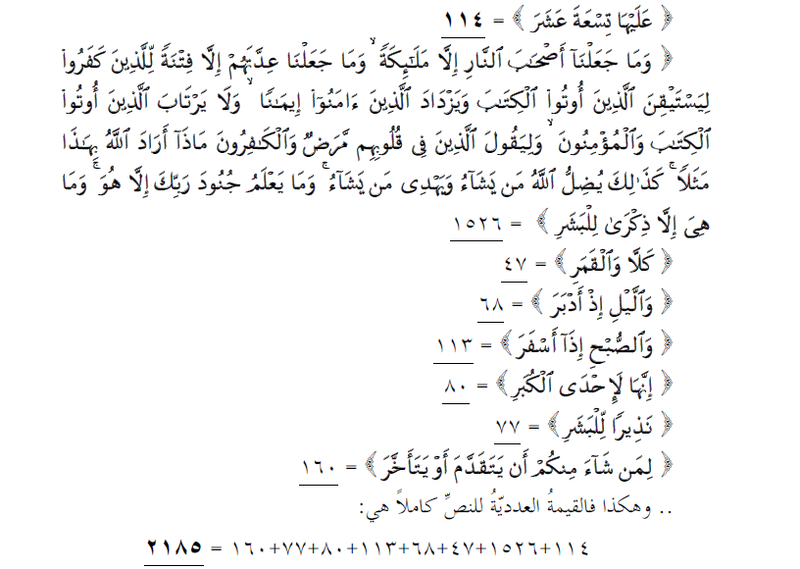 In the red example, the ALIF here is a long one, as in Adam in Arabic. As you know, in Arabic, there are long Alifs and short ones. Both count as one. Even in the English word Adam, we clearly see in the pronunciation that the first "a" is a long one, while the second "a" between the "d" and "m" is a short one. English doesn't recognize in its writing the long and short a's. But Arabic and other languages do. I am adding all of the rules that I am discovering from brother Adnan to his table at: http://www.answering-christianity.com/main_table.png. I am still building this. It's a mess, but you'll be able to read through it, Insha'Allah.